It is December in Glasgow. The nights are getting longer, the weather is colder and wetter than before, and there’s a big rush to cross items off of the to-do list before the start of the Christmas holidays. Although carrying out your own independent research is highly rewarding, sometimes the building of workloads and upcoming deadlines can cause us to feel the pressure of PGR life. Biologically, stress is a good thing. The emotion that we call “stress” is useful in terms of our survival, for when we are confronted by a threat, stress urges us to stand and fight or otherwise flee in difficult situations. Unfortunately, our modern lives present us with “threats” such as looming deadlines that won’t have any impact on our survival, but our brains can’t tell the difference, causing us to feel stressed! If you’re feeling the pressure right now, here are some handy tips for making PGR stress more manageable. Stress and sleep are closely linked. For example, when you are deprived of sleep, you are more prone to suffer from stress! Maintaining a regular, daily rhythm of sleep is important in order to keep your stress levels low. Improving your “sleep hygiene” by going to bed at the same time every night, and also limiting the use of technology such as laptops and phones in the evening, will improve your sleep and ultimately your ability to cope with stress during the day. This year, the UofG Psychology department ran workshops specifically for PGRs focusing on the science behind sleep, and practical ways in which you can improve your sleep quality. These workshops proved very popular and will surely run again, so stay tuned for updates on future sessions! Personally, when I feel overwhelmed with stress, I find it very useful to make a list of all the tasks that need to be done,, and then I rank them by order of priority. Then, I look through this list and ask myself: is it necessary that I do this task today? Can I do this task tomorrow/next week instead? Prioritising tasks breaks down a mountain of responsibilities into a smaller, more manageable amount of work. Taking on tasks one by one, rather than all at once, will help decrease your overall stress levels. Having trouble with organising? A friend of mine recently introduced me to the concept of bullet journal, which is a great way of prioritising tasks according to different timeframes. The general idea of bullet journal is that it is based “at the intersection of mindfulness and productivity”, and using a plain notebook, you can creatively plan out your monthly, weekly and daily goal pages in whichever way suits you best. 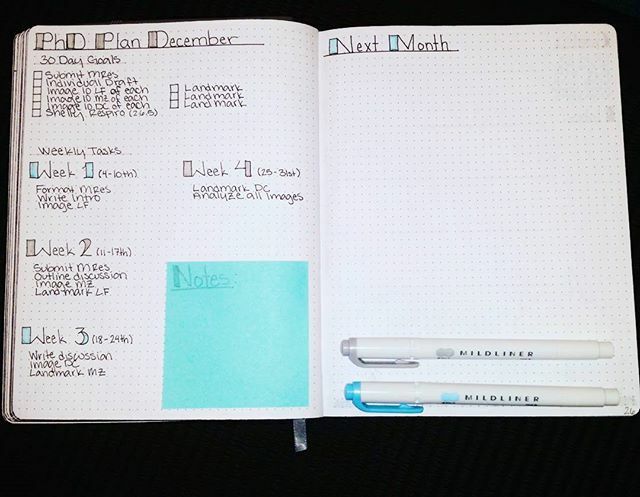 Example of a Bullet Journal for organising tasks! Photo by Tiffany Armstrong. Used with permission. If you don’t feel creative enough for a bullet journal, there are free smartphone apps such as ToDoist and Wunderlist, which are great for list making and organising tasks in order to keep stress levels down! Keep up with your hobbies / Get active! It is easy to skip out on your hobbies if you’re feeling like you have too much work to get done. However, it is very important to maintain a good work/life balance, and to keep on doing the activities you enjoy! 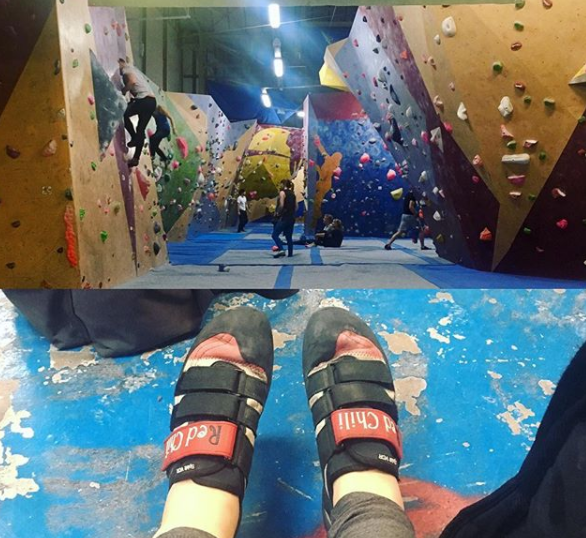 Personally, I enjoy indoor bouldering at The Climbing Academy Glasgow near Kinning Park, as it is is good exercise, and is also a great activity for mindfulness. If you’re short of hobby ideas, why not have a browse at the long list of clubs and societies affiliated with the SRC, and try something new? The Gilchrist Postgraduate Club also runs regular social events and activities for PGRs, such as Knitting For Fun and Clay Pinch Pot workshops! Check out the Gilchrist Facebook Page for more details on upcoming events. Exercise in any form can also act as a great stress reliever, giving you a boost in mood and improving your health at the same time! UofG Sport runs many fun fitness classes and activities in the Stevenson Building and at the Garscube Sports Complex, which are all included in the gym membership costs. GUSA also run a gym buddy system, if you don’t feel comfortable exercising on your own! The upcoming Christmas holidays should be a break, and not seen as an opportunity to catch up on work! Taking some time away from your research is important for focus and productivity, otherwise, you might end up experiencing burn-out. Even short breaks can be beneficial for reducing stress. Why not take one hour during the day to step outside into the Glasgow sunshine? PGR lunchtime walks, part of a well-being initiative run by the Researcher Development Office, are a good opportunity to take a short time-out and meet with other UofG postgraduate researchers, who may be feeling a similar way to you! PGR lunchtime walks currently run every Tuesday on Gilmorehill Campus, starting at 12:30 outside the Gilchrist. If you’re over at Garscube campus, stay tuned for news on upcoming PGR walks there! Any #UofG #PGRs got any places they can recommend? Or favourite places visited on #PGRLunchtimeWalks? Follow #PGRLunchtime walks over on the @UofG_PGRBlog Twitter! If you don't fancy a walk around campus, the Researcher Development Office is also currently running friendly and relaxed PGR Community Garden sessions (#PGRCommunityGardening) on Thursdays 1-2PM. You can get involved by signing up for sessions running in 2018 using the Registration Form . We hope that these tips will be useful for managing PGR stress. However, sometimes stress can get too much. If you are feeling this way, the university counselling service runs on the day drop-in appointments (bookable online from 9AM), during which you can talk to a mental health advisor in confidence. Do you have any extra tips to manage PGR stress we might have forgotten about? Let us know in the comments below!